We are a union of people affected by cancer, their family members and friends, people who take care of people with cancer, health care professionals and cancer researchers committed to increasing access to effective cancer treatment and care. We are particularly concerned about the rapidly escalating cost of cancer medication and seek to fight for cancer treatment and care to be affordable and available, everywhere, for everyone who needs it. UACT letter to US Congress regarding NIST recommendations to limit Bayh-Dole Act safeguards. UACT joint comments to NIH regarding prospective exclusive license of CAR T cancer treatment to ElevateBio, December 5, 2018. UACT letter to President Trump regarding protections for pre-existing conditions, October 31, 2018. UACT statement regarding President Trump’s speech on drug prices, October 25, 2018. UACT statement regarding announcement of a compulsory license on Revlimid in Russia. UACT position on external reference pricing and parallel trade for drugs, vaccines and other medical technologies, July 19, 2018. UACT statement regarding initial draft of UN Political Declaration on the prevention and control of non-communicable diseases. UACT testimony on the USTR Special 301 process, March 8, 2018. UACT statement regarding Chilean Congress resolution calling on the President to advance the compulsory licensing request on HCV drugs. UACT urges NAFTA delegates to expand access to affordable medicines. UACT asked members of US Congress to authorize Medicare price negotiations, backed by compulsory licensing authority. UACT and 22 cancer treatment NGOs working in South Africa submitted comments on the Draft South Africa IP Policy. UACT delivered a letter to the Chairman and Ranking Member of the US Senate Health, Education, Labor, and Pensions (HELP) Committee regarding the soon-to-be introduced comprehensive health care bill, urging the HELP committee to hold public hearings on how the GOP-led health care reform bill will affect cancer patients. UACT and 56 civil society organizations and academic experts call upon the University of California to drop its appeal on the Xtandi patents in India. 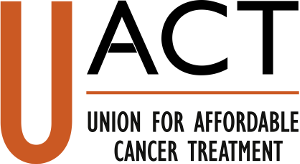 UACT was among 29 civil society organizations and 33 health professionals, activists, and economists — including Nobel Prize laureate Joseph Stiglitz — asking delegates to the World Health Assembly (WHA) to support a feasibility study on the progressive delinkage of the costs of research and development from the price of cancer medicines. On April 19, 2017, UACT and KEI sent a letter to Secretary Tom Price of the Department of Health and Human Services, and to Secretary Jim Mattis of the Department of Defense, requesting that the Trump Administration reevaluate the January 2016 Xtandi petition that the government use its rights in patents under the Bayh Dole Act (35 U.S.C. §§ 200 et seq.) for the excessively-priced, blockbuster drug enzalutamide (marketed by Astellas Pharma as Xtandi). Follow our Xtandi page for the latest updates. to the Medicines Patent Pool. UACT provided testimony at the hearing for the US Trade Representative’s Special 301 Review process. Request for compulsory licences in the UK on the patents for the breast cancer drug Roche’s Kadcyla (T-DM1).